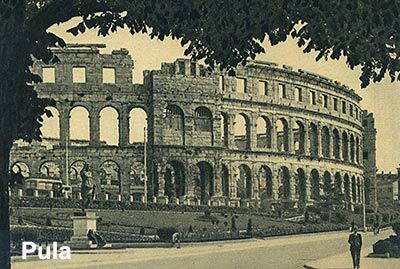 Pula is a popular visitors destination in the western part of Croatia where visitors come to see lovely old Arena – the remaining Roman amphitheatre and other beauties of the Istrian peninsula. The town has excellent connections from its airport to numerous European destinations (EasyJet, Lufthansa, British Airways all fly there). The town is also a good choice to visit especially if you intend to visit Venice, which is just a ferry ride away. Or Trieste, another great and convenient transport hub in the region worth visiting if you have some spare time. What is the best way to get to Dubrovnik from Pula is difficult to answer – it is not as straightforward as it looks on the map. Pula is quite far from Dubrovnik – the distance between these two cities is about 420 km ‘as the crow flies’ (226 nautical miles) while actual driving distance is just over 700 km. Furthermore, there are no direct bus, ferry or flight connections from Pula to Dubrovnik. There is no train connection either. All of that makes the journey complicated. However, there are several other options to consider. Depending on your circumstances, the preferred way of travel and available time some of them can be pretty good and enjoyable. Twice a week flights, Mondays and Fridays, March to October, departing Pula at 11:25 arrives in Split 12:15 (45 Euro one way). Take a connecting bus from Split town to Dubrovnik (another 4 hrs approx). You can expect to be in Dubrovnik by 18:00. Early afternoon flight departing Rijeka at 14:30 arrives in Dubrovnik at 16:20 (50 Euro one way). March to October, twice a week service, Tuesday and Thursday. To reach Rijeka airport in time you have to leave Pula early morning by bus or taxi (the distance is about 110 km which is 1 1/2 hours drive). You can also choose to rent a car for the first leg of the trip with pick up Pula and drop off Rijeka option – see what is available. Both flights are operated by Trade Air local carrier – see schedules and booking info. The best what can I say about this option is to maybe consider to take an overnight bus from Rijeka if the ride doesn’t disturb you to sleep. I sometimes find overnight buses easier to cope with long-distance travel. The good thing about this route is that it is available all year round and in most of the weather conditions so you can actually rely on it whatever circumstances. This can be a nice travel option only if the weather is fine. The ferry leaves Pula at 07:00 arriving in Zadar at 13:15. On its way, the ferry stops on several local islands picking up and dropping off passengers on its way to Zadar (see the map here and here). In winter it is in the service on Fridays only; in June and September on Wednesdays & Saturdays. Tip: Alternatively, you can also consider to take a bus from Zadar to Split (3 hrs, 90 Kuna) and change there for Dubrovnik one. This way you will have more options in choosing the suitable bus timing. Yes, this is a very nice and attractive journey involving some island hopping in the Nort Adriatic BUT – it is weather permitting. Fast catamaran ferry from Pula to Zadar doesn’t operate in rough seas so you may end up stuck for a couple of days waiting for the weather to get better. If you are driving, the first thing you have to decide whether you have the time or not. If you don’t have time, then you have to drive along the coast all the way to Dubrovnik, about 700 km – see below direction map. It will take you about 9 hrs to arrive at your destination. Alternatively, if you do have some time at your disposal, then great! – you can slowly drive down the coast, stopping on some of the islands and have good fun enjoying your journey.